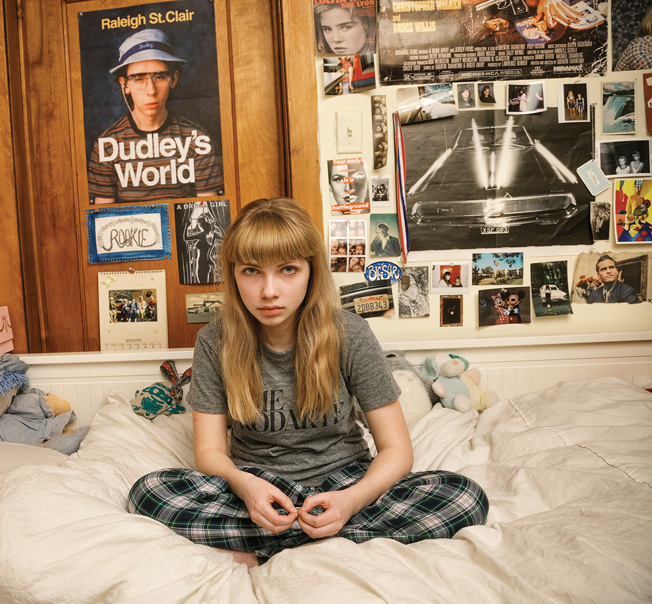 Tavi Gevinson has been called everything from the future of fashion to the future of journalism (by Lady Gaga, no less). Pretty heady titles for anybody, especially a blogger who has yet to finish her junior year of high school. But if the media insist on labeling anyone “the future of fill-in-the-blank,” they could do a lot worse than Gevinson. Gevinson created her first blog, The Style Rookie, at age 11. At the time, she didn’t have a grown-up helper or connections in the fashion world or access to designer threads—just a fascination with high-concept design (Comme des Garçons and Rodarte were and still are among her favorites), a gift for writing and the sensibility to turn a thrifted sweater, her mom’s skirt and a pair of oversized sunglasses with the lenses popped out into a full-blown fashion statement. In no time, the pixieish Gevinson was taking breaks from her middle-school studies to sit front-row at Fashion Week, contribute to Harper’s Bazaar and serve as muse for Rodarte’s collaboration with Target. Now 16, Gevinson’s focus is Rookie, an online magazine for teen girls she launched in 2011 and where she serves as editor in chief. Independently owned (ad sales were originally handled by New York Media, and currently by Say Media), the site is a mix of personal essays, nostalgic musings and cultural tidbits with a feminist slant, and counts more than 40 contributing writers. Advertisers have included Target, Urban Outfitters and MTV. Gevinson runs her budding empire from her parents’ home in Oak Park, Ill., where she attends public high school. She’s been heralded as both a modern fashion icon and an arbiter of teen taste. In conversation, she comes off as self-effacing but confident. Her image is that of both cool kid and outsider—in other words, she’s the girl you wish you could have been best friends with in high school. Now, thanks to Rookie, an entire generation of teenage girls is getting that chance, as the worlds of fashion and media follow her every move. So, Lady Gaga called you “the future of journalism.” How does it feel to have that weight on your shoulders? I don’t know. Anxiety is kind of my comfort zone when it comes to that kind of thing, but not in a bad way. I just try and remind myself not to get too comfortable. I’m happy to take credit where credit is due. When I heard the Lady Gaga thing, I was like, “That was really nice of her!” But she’s not a journalist, you know what I mean? With Rookie, I didn’t think back when I was 12, “How do I stay relevant? In a few years, I’ll start a magazine.” It happened organically. If the next thing I do is not necessarily filling the role of “the future of journalism,” it’ll probably be whatever is making me happiest, and that’s enough for me. What’s interesting is that, through all of this, you’ve led a pretty normal life with your family in the suburbs of Chicago. How did you reconcile your two worlds? It’s definitely a balancing act. But I prefer it to the alternative, which is to pick one. I don’t want to just go to high school, and I don’t want to just be homeschooled and live my life working behind a computer. It wasn’t easy at first—I remember being really sad going home after my first fashion week because I felt like, “Oh, it’s just back to middle school and all of these people who don’t understand me and make fun of my outfits.” Now, I’m in high school and I have really great friends and more to look forward to when I come home.